Flutes were an especially popular cut-glass motif during the early and middle periods of American cut glass. The earliest-available advertisements from glass companies and independent cutting shops frequently mention decanters and drinking glasses cut in flutes for sale (e.g., Wilson 1972, pp. 197-207). The motif continued to be widely used during the Brilliant Period, usually combined with other motifs. The examples illustrated in this file range in size from very narrow comb flutes to the wide flutes of the so-called broad-flute style. The latter was introduced in England during the 1830s, and it soon became established in this country as well. Flutes of all sizes continued to be popular throughout the nineteenth century and twentieth centuries. Today, items cut in flutes are often referred to as being “in the colonial style” although there is no connection with America’s colonial (i.e., pre-Revolutionary War) period. LEFT: Decanter, probably Irish, cut with medium flutes over comb flutes on its body and flutes cut between the three applied neck rings which are faceted. Ground and polished pontil. Damage: crack at neck. Found in RI in 1988. H = 7.5″ (19.0 cm). Comb flutes on decanters should be closely examined. They are sometimes mold-blown, rather than cut, and are produced through use of a dip mold. The mold may, but rarely, contain the incised name of an Irish glass company or seller of glass which is transferred to the decanter’s base. Such a signature is faint and may easily be overlooked. It greatly increases the value of such a decanter, but, unfortunately, forgeries are known. CENTER: Solid yellow wine glass made with uranium and cut with nine flutes, confined to the bowl. Solid, uncut stem with centrally-placed knop. (Apparent air bubbles are reflections.) 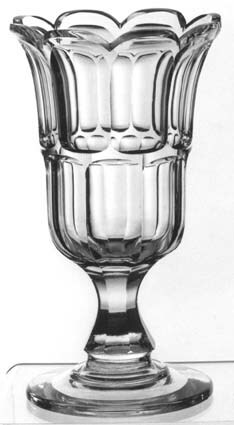 A three-part glass with a ground and polished pontil. H = 4.9″ (12.4 cm). Sold for $70 in 1996. 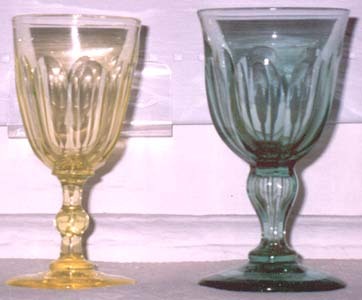 RIGHT: Solid bluish-green wine glass cut with seven flutes, running from the bowl to the base of the stem which is an inverted baluster with air trap. H = 5.0″ (12.7 cm). Sold for $91 in 1996. Both glasses were found in Angelica, Allegany County, NY in 1994. Flutes are usually concave in profile, having been cut with a slightly convex cutting wheel, but they can also be flat-cut, in which case they are sometimes referred to as panels. The stem of a drinking glass, for example, can be said to be fluted or panel-cut. Such stems are occasionally also referred to as faceted, but this term should probably be reserved to describe glass cuttings that mimic the flat-cut and polished faces of gems (the “birthplace” of modern cut glass). Stoppers are often faceted, but they can, of course, also be fluted as well as cut-in-pattern. LEFT: Celery vase cut in a pattern sometimes called “Alternate Flutes,” where the flutes are flat-cut. Scalloped rim; solid balaster stem, fluted. Ground and polished pontil. Mid-nineteenth century. H = 9.5″ (24.1 cm), wt – 2.5 lb (1.1 kg). Sold for $100 in 1990. CENTER: Red cut-to-clear decanter. What appears to be a row of short flutes on the decanter’s shoulder is described in the writer’s notes as a row of bullseyes. Note the decorative use of a “string ring”. Ground and polished pontil. Original stopper. Date uncertain; possibly a twentieth century re-creation of a nineteenth century item. H = 12″ (14.5 cm), max D = 3.75″ (9.5 cm), wt = 2.5 Lb (1.1 kg). Sold for $200 in 1990. RIGHT: Celery vase with two rows of broad flutes in a pattern similar to Ashburton. Ground and polished pontil. Mid-nineteenth century. H = 9.75″ (24.8 cm), wt = 3.0 lb (1.4 kg). Sold for $100 in 1990. Flutes that are convex in profile are called pillars or pillar flutes. The term is usually extended to include other shapes as well, including tusks and cabochons which are smoothly cut and convex in profile. An early example of pillar flutes is shown and discussed in the file, Pillar cutting. Patent no. 20,504 of 1891 includes four pillar-cut rings linked by two ribbons of cane with short segments of pillar cutting. In the 1840s Hoare was working in the English Midlands where pillar cutting was being practiced at major glasshouses. He later used this technique, not only in the Crystal City pattern, but also in several other patterns of the 1880s and 1890s, although few of them are found today. Costly when produced, probably relatively few examples of this type of cutting were made. At least one variation of the Crystal City pattern is known; it is believed to have also been produced by J. Hoare & Company.